We are the finest Kustom Kulture Artshow in Europe. We are the only free show in the galaxy completely dedicated to Kustom Kulture art. Come visit us in Bonn in 2020 and enjoy the art of the best Kustom Kulture artists from all over Europe! HANDLETTERING, SIGN PAINTING, KUSTOM ART, FORGING, DAY OF THE DEAD ART, ILLUSTRATION, DIGITAL ART, EMBROIDERY, PINSTRIPING, ENGRAVING, SEWING, CARTOONS, METALWORK, TAXIDERMY, SEAT MAKING, SCULPTING, TATTOOING, EXTRA FINE LOWBROW ART, KUSTOM PAINTING, HOTROD AND MOTORCYCLE ART, FOOD, VENDORS, CLOTHING, DRINKS, LIVE MUSIC AND GOOD TIMES! Edition number 8 will be held at the fabulous Basecamp in Bonn on the Easter weekend, 11 and 12 april, we open at 10:00 and close around 18:00. Visitors can make use of the biergarten and the burger bar outside, indoors you can also buy drinks. The entry to the show is completely FREE for all visitors..
Bring your bike, your kustom car or hotrod, we have tons of room to park your baby. Come and hang out with us, bring the family, have a great day and get yourself some art while you are there! 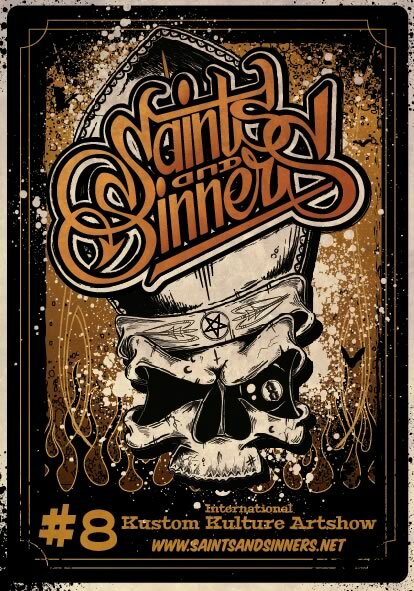 For the first time our show lands in Germany, we have been looking at different options the last year and this is the absolute best spot for Saints and Sinners 2020. Basecamp is an absolute kickass location! Lots of room indoors and outdoors and now again a free show for all visitors!